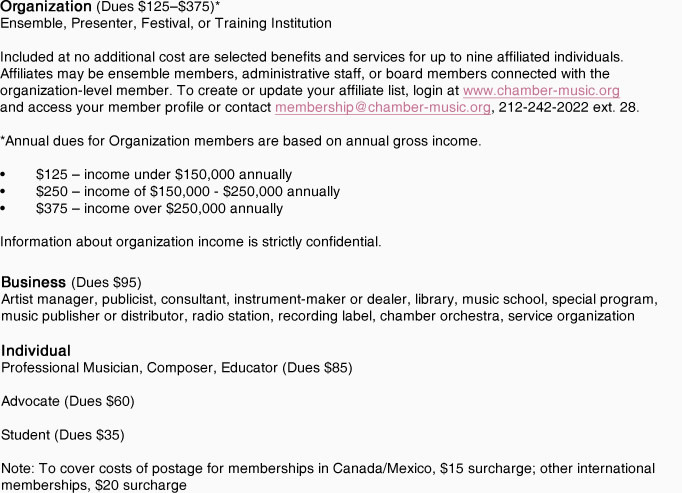 Membership in Chamber Music America gives you access to a wide range of services, special offers, and discounts, which correlate with the type of membership you choose. CMA supports members through grants, awards, and professional development opportunities. CMA's Residency Partnership Program encourages educational projects in which jazz, classical/contemporary, or world ensemble music is presented outside traditional performance venues and in community settings. Classical Commissioning offers support to presenters and classical/contemporary and world ensembles based in the U.S. for commissions of new chamber works. New Jazz Works: Commissioning and Ensemble Development supports professional U.S. ensembles for the creation and performance of new work in the jazz idiom. Presenter Consortium for Jazz provides support to consortiums of three U. S. presenters that collectively engage up to three professional U.S. jazz ensembles (consisting of 2-10 musicians each) to perform at each presenter’s venue. Organization-level membership is required for all applicants. CMA recognizes extraordinary achievement in the chamber music field though the CMA/ASCAP Awards for Adventurous Programming and CMAcclaim. First Tuesdays, a series of free professional-development seminars in New York City, is presented in collaboration with Midtown Arts Common and St. Peter's Church. Members have access to recordings of these seminars. CMA program staff is also available for consultations by appointment. All members can post and respond to topics of concern on Sounding Board, the member discussion forum. Ensembles, Presenters, Festivals, Professional Musician, Composer, and Educator members can post concerts and events to the CMA national calendar, upload audio files, embed YouTube videos, list new recording releases, and create an online profile. Business members can create an online profile and post news about their latest projects. All members receive a subscription to CMA's full-color bimonthly magazine, Chamber Music. The magazine includes features, essays, excerpts of CMA-commissioned ensemble music, news relevant to the chamber music field, and regular columns on books, recordings, and composers. Organization and Business members receive CMA's professional development newsletter, CMA Matters, a quarterly bulletin focusing on business-related issues for ensembles, presenters, festivals, and self-producing organizations. Published each fall as a supplement to the September/October issue of Chamber Music magazine, the annual directory is a 300-page compendium and resource book for the U.S. ensemble music community. It lists all of CMA's member ensembles, professional musicians, presenters, festivals, training programs, businesses, educators, composes, and advocates. Organizations and Professional Musician/Educators have the option to add biographical information and a publicity photo. 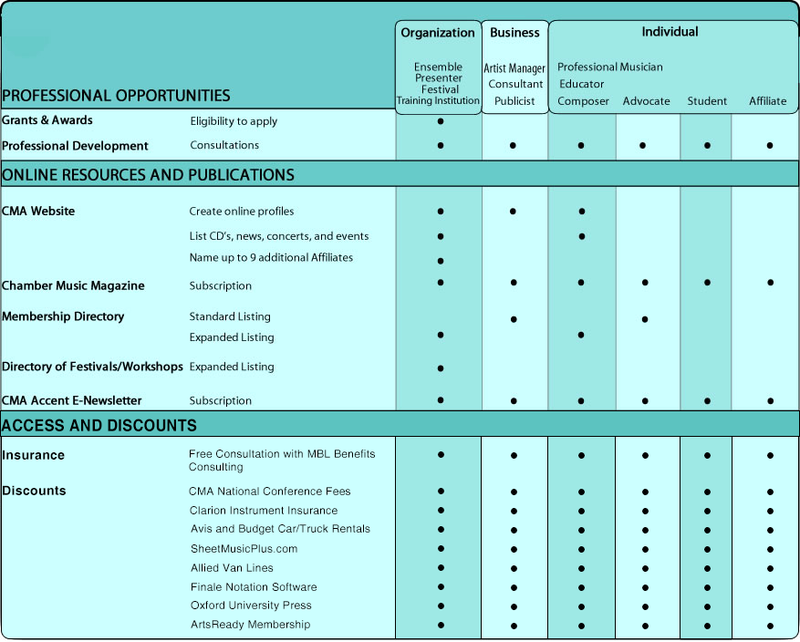 Listings in the printed membership directory are generated from current members’ online profiles. Members have the opportunity to review their printed listing, via email, before publication. An advance guide to the spring and summer chamber music season, this directory is published each spring as a supplement to the March/April issue of Chamber Music magazine and is available online in PDF format. Ensemble, presenter, festival, and training institution members are contacted via email each fall and invited to list their seasonal programs for the following year in this directory at no additional charge. Every week, members receive Accent, an e-newsletter featuring member news, upcoming CMA events, listings of opportunities in the chamber music field, and other industry-related topics. Members may purchase mailing lists to promote concerts and events to CMA colleagues. Available are Excel files listing the complete membership (as well as lists of specific member groups—ensembles, presenters, educators, Conference registrants, etc.—or particular geographic areas). Your CMA membership gives you access to a wide range of services, special offers, and discounts. Chamber Music America members receive 50% off their first annual Premium Membership to ArtsReady, the web-based emergency preparedness platform designed to provide arts and cultural organizations with customized business continuity plans for post-crisis sustainability. ArtsReady memberships are currently $300; CMA members pay $150 for the first year. MBL Financial Group offers CMA's New York State members access to disability, variable permanent life, health- and long-term care insurance policies, as well as financial planning and pre-paid legal assistance services. To read definitions and descriptions of these products, go to www.mblfg.metlife.com. Drawing on its database of providers in thirty-two states, MBL Benefits Consulting offers free consultations to CMA members about individual insurance policies. MBL also offers liability insurance at competitive rates to CMA members in qualifying states. CMA members receive a free consultation with MBL, which will draft a policy to meet their needs. Members attending the annual National Conference receive a significant discount on registration fees. Clarion Associates, Inc. offers U.S.-based CMA members discounts on new policies. Clarion offers extensive protection for musical instruments and recording equipment, as well as performance liability insurance at competitive rates. Carey Moving and Storage, an authorized agent for Allied Van Lines, offers discounts to CMA members on full-service, long-distance moving and storage. Allied Van Lines' Moving Benefits program, a resource not only for moving to a new home, but also for buying, selling, and financing services, offers special credits and rewards to CMA members. Members receive a 20 percent discount at more than 5,000 Quality Inn, Clarion Hotel, Comfort Inn, Comfort Suites, Sleep Inn, Mainstay Suites, Econo Lodge and Rodeway Inn locations worldwide. Avis Budget Group gives CMA members up to 25 percent off promotional rates for car and truck rentals booked through Avis or Budget. CMA members are eligible for the academic discount on a first-time purchase of MakeMusic's Finale notation software. Sheet Music Plus offers CMA members a 10 percent discount on all items. Oxford University Press offers CMA members discounts—up to 20% off—on its entire catalog.